AFA Census: Take the Census Today! Home > News > AFA Census: Take the Census Today! 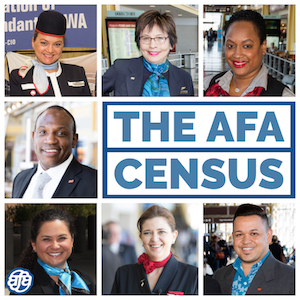 The AFA 2019 Census is a project to better understand the demographic make-up of our union, including your aspirations, needs, and preferences. We also want to know in what areas of your community you may already be engaged in making a difference for you, your family, and the place where you live. All of this will help us build power together so we can continue to advance our Flight Attendant careers. The University of New Hampshire Survey Center (UNHSC) is conducting this very important data gathering effort. You should have received an email last week and possibly a phone call to encourage you to complete the Census. Once you complete the Census, you will not be contacted by UNHSC further. Our contract with UNHSC ensures your information remains confidential within AFA. It does not allow UNHSC to share any of your information with outside organizations. A summary of the final results will be shared with AFA members.